Tofu at most Asian restaurants is usually so good that I’m left thinking about it weeks after I’ve had it. 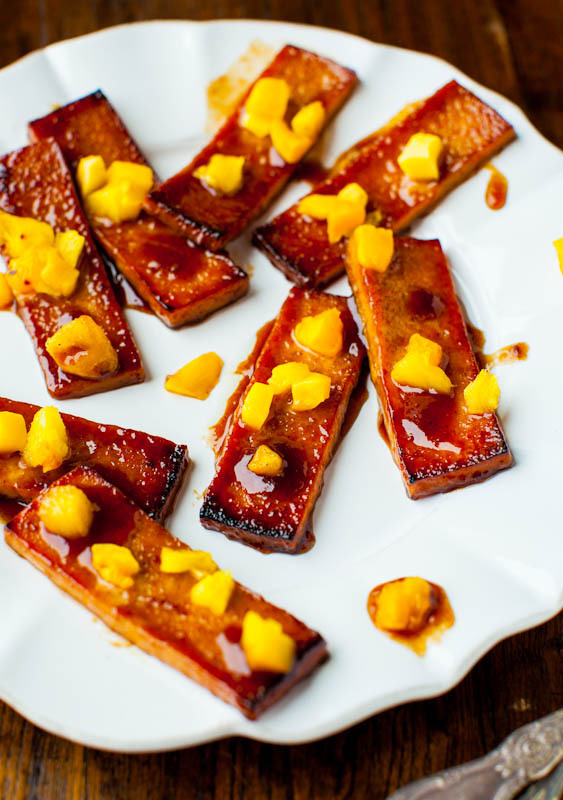 It’s a perfectly cooked balance of crispy and tender, firm yet chewy. The sauces are right on point; tangy, slightly spicy, and leaves me wanting more. Or if you’re familiar with the tofu that Whole Foods sells in its deli cases for about $9.99 a pound and to feed a family at those prices, you’d need three jobs just to afford to get dinner on that table? Yeah, that’s the tofu I wish I could afford to eat but I can’t. It’s always amazes me that people pay those prices for deli food that you bring back home, likely re-heat in the microwave, and eat it out of a cardboard container. When you can do this. Let’s make restaurant-style tofu at home. First, you must press your tofu. If you don’t have a tofu press, and you eat tofu with any regularity or would like to start eating more tofu, this gadget is worth it’s weight in soggy paper towels because all the water stays in the box and floats to the top, and the drying tofu is at the bottom. But if you don’t have a press, wrap the tofu in paper towels, double or triple layer them, wrapping them around the tofu many times like it’s a little present. Lay the tofu on a cutting board or flat surface. Put cookbooks, a heavy metal frying pan, or something with substantial weight on top of the tofu. Press the tofu for at least 1 hour, in whatever manner you’re doing it. I usually put my tofu in the tofu press before bed and refrigerate it, and the next morning, I slice it and get it ready for marinating. By dinner time that night, it’s ready to be baked off. 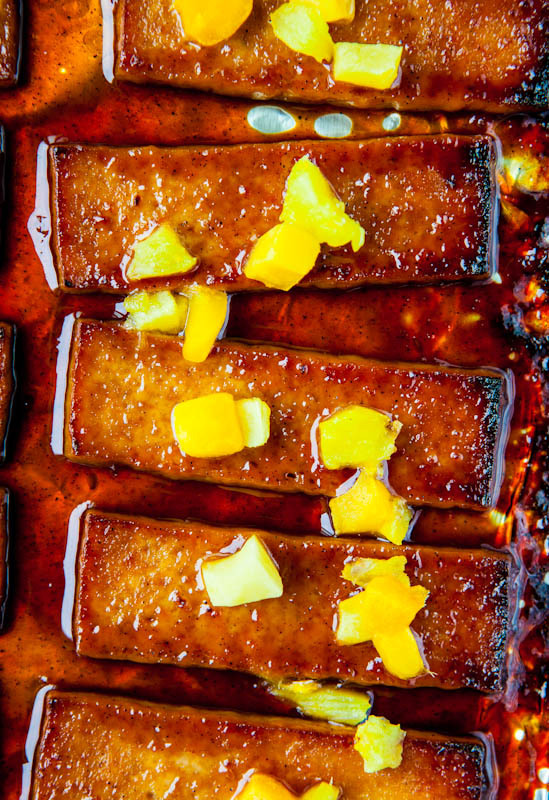 Try to think one day ahead for this and all tofu meals between the pressing and the marinating, but pressing for 30 minutes and marinating for 30 minutes is better than nothing if you didn’t budget in a day’s notice. Who does. Slice the tofu into 16 thin strips, arrange it a foil-lined pan and you have to, I repeat must line your pan with foil unless you love doing dishes with lots of elbow grease and blackened bits flaking off on your sponge and making your kitchen sinks look like a dirt pile. Use foil and it will all be contained within. 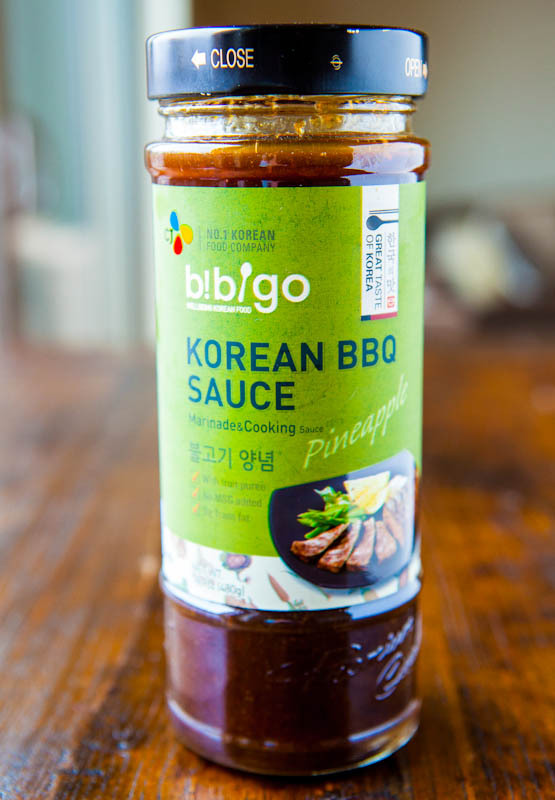 If you don’t have Korean Barbeque Sauce, use some Bone Suckin’ Sauce or your favorite bbq sauce. I wouldn’t get too hung up on if the packaging says Korean or not. Sodium is sodium. Gently and evenly, pour the bbq sauce over the tofu. Please Note: When you are ready to bake this, you cannot leave the kitchen for the 15 minutes this is broiling. This is one of those times where you cannot multi-task, go upstairs and fold the laundry, or check your email “real quick”. 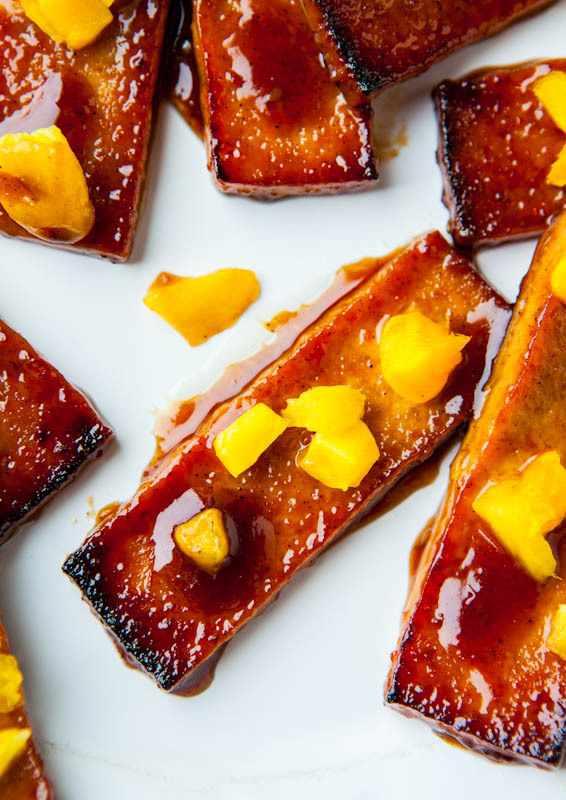 Real quick’s turn crispy edges into char city and your house reeks of burnt soy for 4 days. You have to stay in the kitchen because this can and will burn on moment’s notice (between the soy and the sugars in the bbq sauce) and you need to be right there. 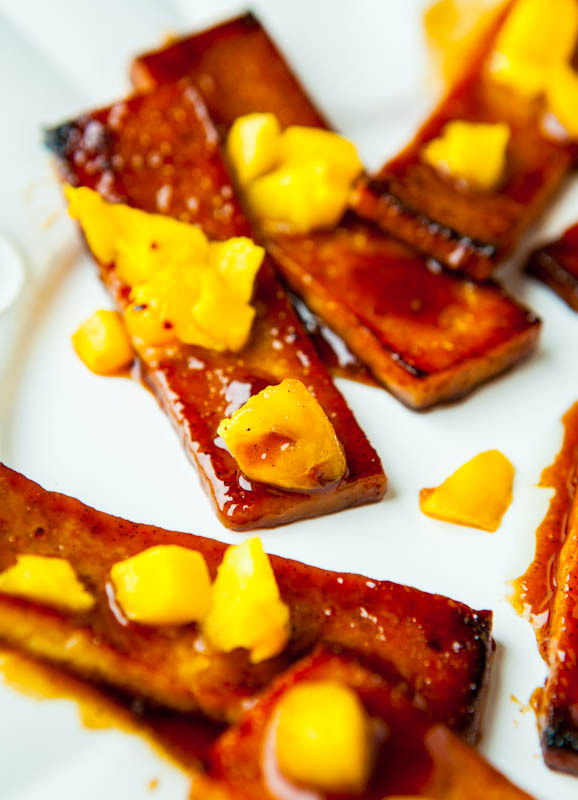 If you think tofu is bland, boring, mushy, limp, or flavorless, you haven’t tried it this way. It’s the opposite of those things based on technique (pressing and broiling) and on the type of marinade is used and how long it marinates. The edges are crispy, the center is tender, the sauce thickens, caramelizes, intensifies and concentrates in flavor. 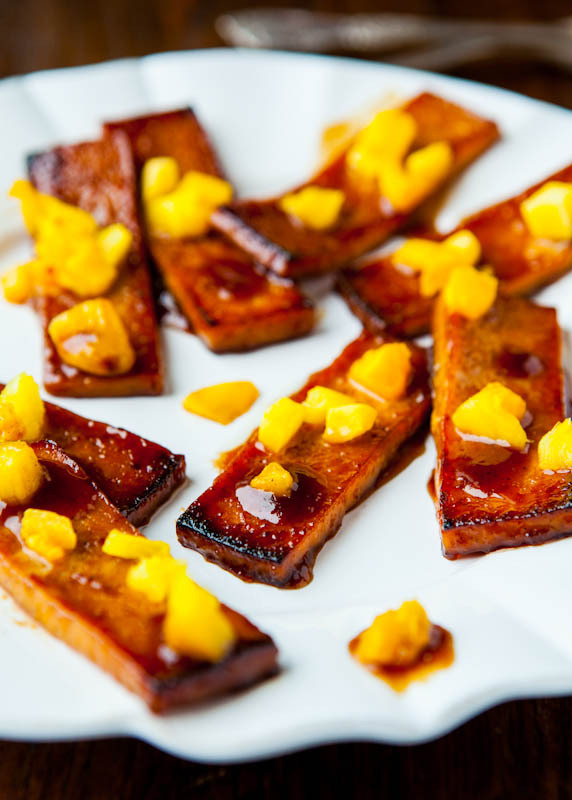 The diced pineapple and mango with their sweetness and acidity balance the saltiness and spiciness from the sauce. This is as close as my husband gets to saying he really likes tofu, rather than simply tolerating it. This is that vegan meal you serve to non-vegans when you don’t want them to turn up their nose at vegan food. Just tell them it tastes like barbeque chicken because everything tastes like chicken. This tastes like really good restaurant tofu and it will cost you about $2.99 to make – one package of tofu, half a jar of bbq sauce, and a half cup of (frozen) fruit. There’s no cleanup because it’s all contained in the foil so it’s a make it and toss it meal. Love those nights when after a long day and cooking that the dishes fairy comes and does them for me. That way I can get started figuring out what’s for dessert. Putting the fire out with a chocolate cake batter milkshake sounds about right. 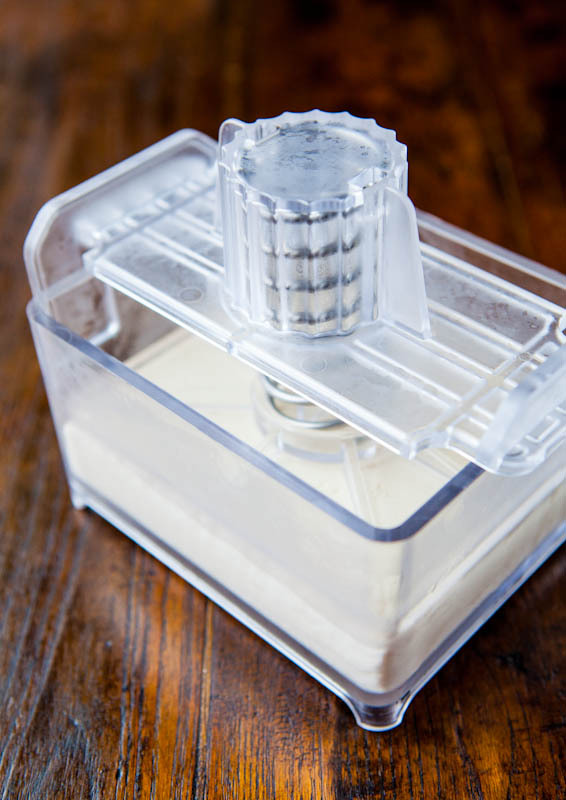 Drain the tofu and press it with a tofu press for at least one hour, or overnight. If you do not have a tofu press, wrap the tofu in paper towels, double or triple layer them, wrapping around the tofu many times. Lay tofu on a cutting board or flat surface. Put cookbooks, a heavy metal frying pan, or something with substantial weight on top of the tofu and allow it to be pressed for at least 1 hour, gently pressing down with your hands from time to time, to encourage the water to release. 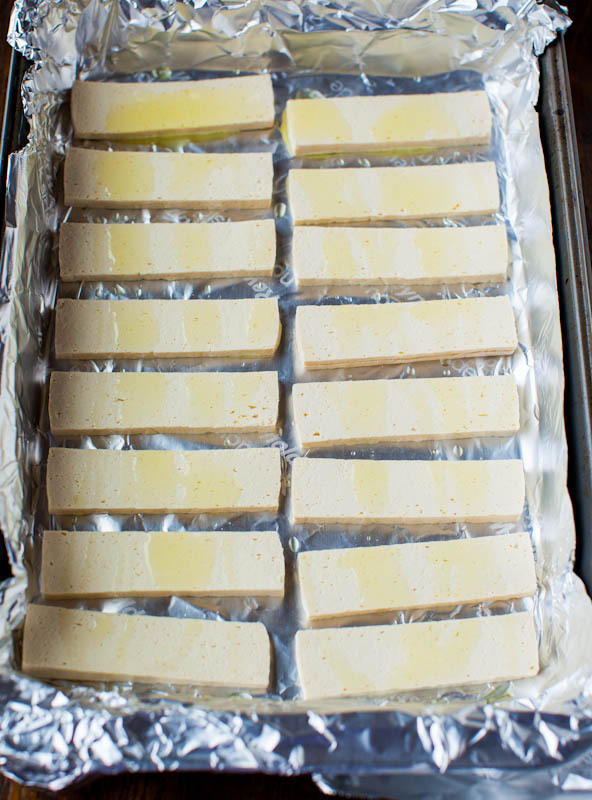 After at least one hour, unwrap the tofu and slice it into 16 thin strips, about 1/8-inch wide. Line a 9-by-13-inch pan with aluminum foil (do not skip this step), carefully transfer the tofu to the pan and place all slices in the pan, making sure the edges do not touch each other. If you want to season it with optional spices, do so. The marinade I used is incredibly flavorful and I don’t find any additional seasonings necessary. Drizzle with olive oil. Carefully pour the barbeque sauce over the tofu. It will look like a lot, that’s okay. 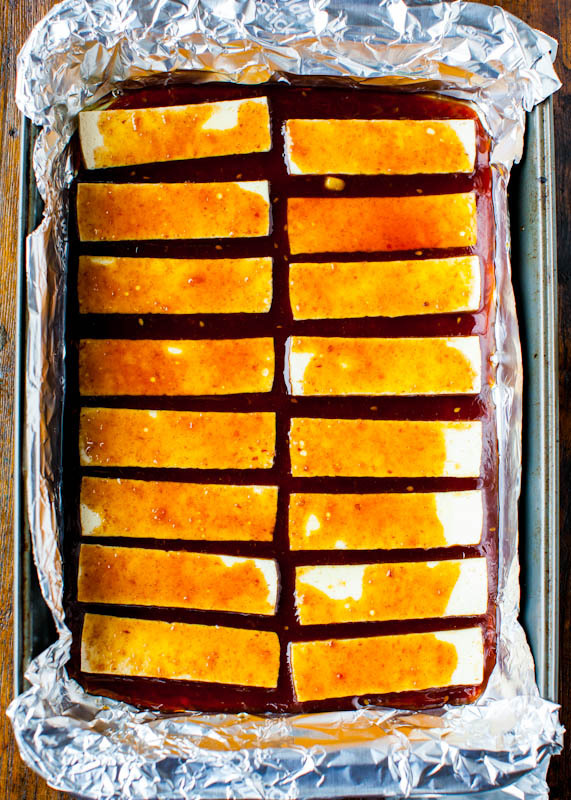 Allow the tofu to marinate for at least one hour, or all day. You can leave it at room temperature or in the refrigerator based on preference (I usually put my tofu in the tofu press before bed and refrigerate it, and the next morning, I slice it and put it in the pan with the olive oil and maridnade, where I let it marinate for half a day or all day until I am going to cook it and I don’t refrigerate it but that’s my comfort level). Note: When ready to actully cook the tofu, make sure you have 15 minutes where you can be attentive, not multi-tasking or distracted, and not having to run in out of the kitchen. This method of cooking tofu can cause it to burn on a moment’s notice so you really need to watch it and be present and attentive. Preheat oven to the broiler setting. Place the tofu under the broiler and cook for 10 minutes. Remove it, flip all pieces over, and broil for 4 to 5 more minutes. Remove it and sprinkle with the pineapple and mango and broil for 1 more minute. Tips: Do not be alarmed if the marinade on the edges of the pan starts turning black. Pay attention to what’s happening with the tofu pieces and look at the edges and corners. They should have a sear, and have just a hint of blackening, or cook until desired level. 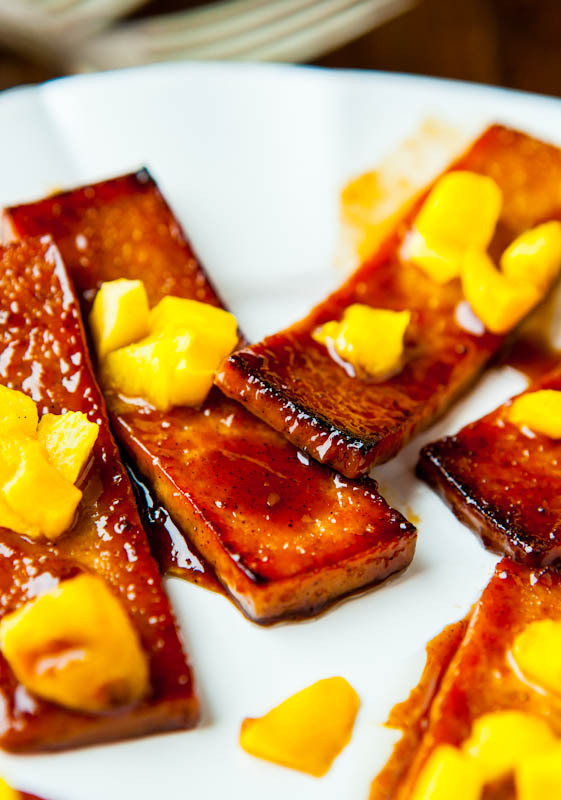 All broiling times are approximate based on how much sauce or marinade you have in the bottom of the pan and its consistency and moisture content (the more excess you have, the longer it needs to cook); the moisture content and width of your tofu and how well it was pressed and how well-done you like your tofu; your oven temperature. This is why you cannot leave the kitchen and must be attentive. My advice is to allow it to get to the edge of looking burned before pulling it so it has that seared and crispy edge with a soft middle texture. 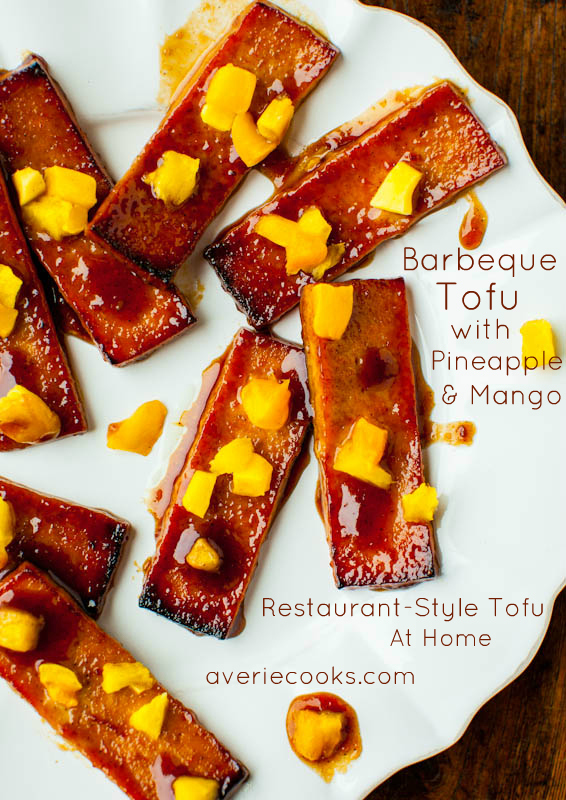 Allow tofu to cool for a few minutes and serve, scooping up any extra marinade from the bottom of the pan if desired. Leftover tofu will keep in an airtight container in the refrigerator for up to 5 days. 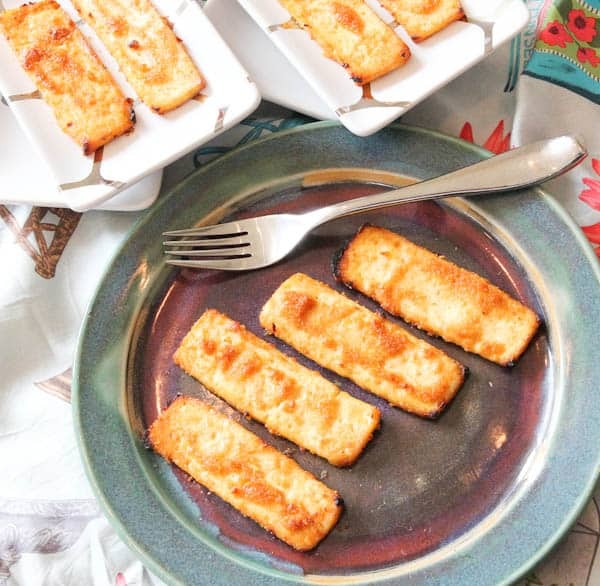 Have you ever made tofu at home? What flavors, marinades, sauces, or spices do you use? What’s your cooking methodology from pressing, slicing, baking, broiling, to pan-frying? There are so many variables involved at every step and I always like to know what people do and what is successful. I like strips and slices rather than little cubes because that means a less cumbersome job of flipping them all, one-by-one, in order to properly sear them. I also prefer to bake or broil rather than pan sear because something about oil splattering on my wrists when I am trying to flip them all over just isn’t fun and that always happens to me; whereas the broiler doesn’t let me down. Pingback: 12 meatless recipes for a deliciously vegetarian 4th of July - How to do everything! Pingback: 12 meatless recipes for a deliciously vegetarian 4th of July - Snap Tips! Soooooooo delicious! Thank you for sharing this recipe! I used Bella sun Lucia Korean bbq sauce.